I first discovered this Nature Preserve with Jess while we were attending Indiana University in Bloomington. It was an adventure just getting there, with Jess trying to direct me based on the directions on the Sucamore Land Trust website which can be found here. But we made it and we are glad we did. We visited Beanblossom Bottoms many times throughout the years. I don’t think there is a bad season in which to visit. The area is always pretty. 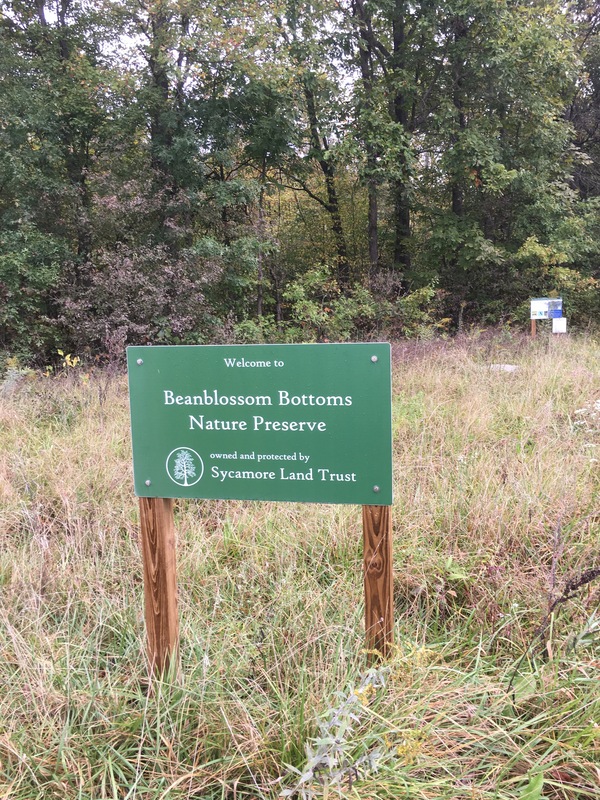 In 2017, the Society of Wetland Scientists designated Beanblossom Bottoms Nature Preserve a Wetland of Distinction aka one of the most valuable wetlands in the world. It is also an Audobon Imporatant Bird Area with eagles nesting in the area each year. Sunday was the first time I took my mom. It was our second Nature Preserve of the day; Leonard Springs being the first. It had stormed the night before and the raised boardwalk trail was slick from the water. There was also a bunch of leaves and sticks down. It made for an entertaining hike. I am a self-confessed klutz and I went sliding along the boardwalk within about 5 minutes of starting. I felt like Tom Cruise in that movie where he wears tube socks, a white button up dress shirt, and sunglasses and goes purposefully sliding on hardwood floor; except my slide was unintentional and nearly ended with me landing on my rear end. I made sure to pay more attention to where I was stepping from then on, but still managed to go sliding a few more times. It all adds to the adventure. A section of the boardwalk trail was closed due to damage from a storm earlier in the year so instead of doing the normal 2.5 mile loop we did a 2.2 mile out and back hike. The slipperiness of the boardwalks added an extra challenge and our legs and core were tired when we were done. Between the two nature preserves and the yummy food that we ate in Bloomington it made for a great Sunday!